Morihei Ueshiba (referred to as O Sensei) was reputedly the greatest Martial Artist to have ever lived, holder of Master scrolls in numerous different arts such as Shinkage Ryu Kenjutsu, Kodokan Judo (very different from the sport Judo we know today) & Daito Ryu Aiki-Jujutsu (often thought of as the parent art of Aikido. 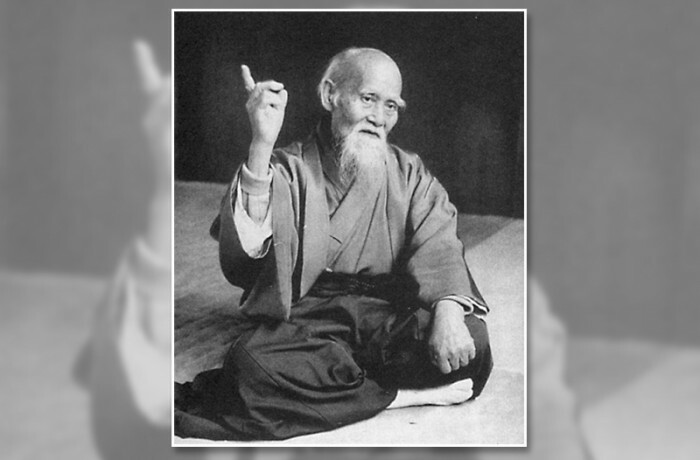 The founder of Aikido, Morihei Ueshiba, was born on 14th December 1883, to a farming family in an area of the Wakayama Prefecture now known as Tanabe. Among five children, he was the only son. From his father Yoroku, he inherited a samurai's determination and interest in public affairs, and from his mother an intense interest in religion, poetry and art. In his early childhood, Morihei was rather weak and sickly, which led to his preference of staying indoors to read books instead of playing outside. He loved to listen to the miraculous legends of the wonder-working saints "En no Gyoja" and "Kobo Daishi," and was fascinated by the esoteric Buddhist riturals. Morihei had even considered becoming a Buddhist priest at one time. To counteract his son's daydreaming, Yoroki would recount the tales of Morihei's great-grandfather "Kichiemon," said to be one of the strongest samurai of his day, and encouraged him to study Sumo wrestling and swimming. Morihei became stronger and finally realized the necessity of being strong after his father was attacked and beaten by a gang of thugs hired by a rival politician.Pellentesque habitant morbi tristique senectus et netus et malesuada fames ac turpis egestas. In faucibus, risus eu volutpat pellentesque, massa felis feugiat velit, nec mattis felis elit a eros.